Punta Carrion – This boulder strewn reef provides a superb introduction to some of the larger pelagics we expect to see in the Galapagos, including white tip reef sharks but also the occasional hammerhead and Galapagos shark. Sea lions are ever-present and there is the opportunity for some macro critter spotting with sightings of neon nudibranchs. The wall has an average depth of 15m (50ft) and mild- medium current is to be expected. Wolf Island – Named after the German geologist, Theodor Wolf, this extinct volcano reaches 253m (780ft) above sea level and lies some 160km (100 miles) northwest of Isabela Island. Land visits are not permitted however bird life, including red-footed boobys and vampire finch, may be spotted from the boat. whale sharks may also be seen here. Divers should also be on the lookout for red-lipped batfish, barracudas, moray eels and dolphins! Darwin Island – This extinct volcano reaching 165m (490ft) above sea level was named in honour of naturalist Charles Darwin. It is amongst the smallest island within the Galapagos Archipelago and like Wolf Island, no land visits are permitted. Perhaps the most famed dive site is “Darwin’s Arch” which provides an amazing drift dive along the wall at an average depth of just 9m. 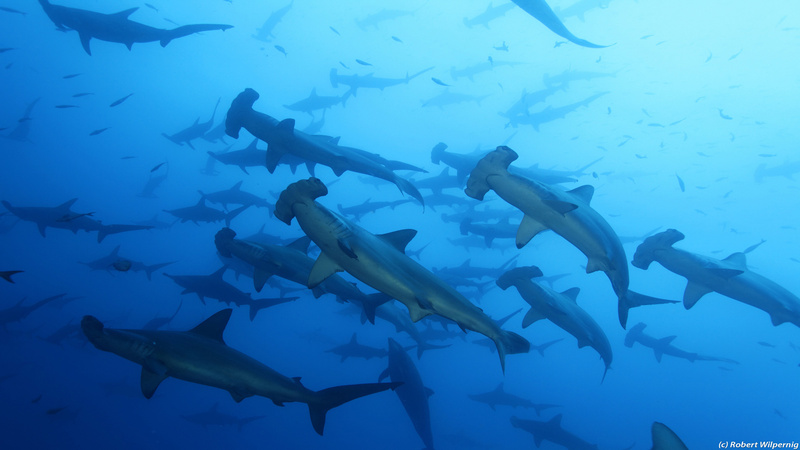 Medium to strong currents are to be expected but bring with them hammerheads, black tips, silky and Galapagos sharks – and in large numbers! Schools of jacks are a common sight, along with turtles, angelfish and moray eels. Occasional sightings of tiger sharks, manta rays and bottle nose dolphins make for a thrilling time spent here. Whale sharks may also be seen between May – November. Douglas Cape – Situated on the northwest point of Fernandina Island, this wall dive, with an average depth of 20m (70ft), offers something truly spectacular and is now famed for the feeding marine iguanas that congregate here along with sea lions, fur seals and speedy penguins! Punta Vicente Roca – Alternatively known as “The Ice Box”, due to its chilling thermoclines, this point off the Northwest coast of Isabela Island offers a wall drift dive, along which mola mola can be spotted. The occasional Port Jackson shark may also be seen as well as the endemic Camotillo (White spotted sand bass). Roca Redonda – This underwater volcano, with its bubbling streams of natural gas (fumaroles) plays home to schools hammerheads sharks and barracuda. With typically strong, changeable currents and some down currents, the diving here is challenging, though with an average depth of 18m (60ft). Cabo Marshall –The craggy volcanic walls are covered with black coral bushes and the sheer variety of marine life is astounding. Sightings of manta, mobula and cownose rays are to be expected during the warm season (November – May). Meanwhile shark varieties include scalloped hammerhead, Galapagos and white tips. Let’s not forget the sea lions and turtles! Cousin’s Rock– One of the most photographically productive dives of the region, Cousin’s Rock is formed of coral covered rock and lava flow. Sea fans, hydroid bushes, red sponges and small hard corals encrust ledges and overhangs, sheltering hawkfish, nudibranchs, frogfish and seahorses. Plenty of larger visitors are also seen including giant manta and mobula rays, spotted eagle rays and hammerhead sharks. The wall drops beyond 30m (100ft) but rises up shallow to just 3m (10ft) providing an ideal spot to end your dive playing with the sea lions. afternoon dive, where we have the opportunity to find seahorses, frogfish and long nosed hawk fish. Punta Albermale – Drifting along this wall on the north of Isabela Island, we stay at an average depth of 25m (85ft) to see manta rays, hammerheads, turtles, schools of barracuda and tuna. Book Your Galapagos Liveaboard Trip Today! The trip and diving were fabulous - with a large contribution for that by the crew. All were great and worked as a team but I must single out Natalia who was a superb guide organizer and helper. It is the best diving holiday we ever made. The diving experience including conditions and wildlife were fantastic. They met my every expectation. Our dive group was well matched and I was allowed to do the kind of diving I really enjoy. Life changing experience, amazing diving, knowledgeable guides, excellent crew. Every one was always ready to help and to do the trip as better as they can. Dive crew very friendly and knowledgeable on dive sites and marine creatures - very comprehensive briefings. Fantastic diving, lived up to my expectations. The best crew all around we have experienced over many live aboards.